Steam is offering increasingly good swag, if enough people preorder XCom. XCom: Enemy Unknown is due October 11th, but in order to entice gamers into parting with their hard-earned before then Steam is offering extras in a Kickstarter-style rewards system. So far pre-orders have gotten 51% of the way to the first tier, but enough pre-orders could entitle customers to benefits up to and including a free game. The first tier rewards you with the Elite Soldier Pack; essentially customizable skins for your cannon fodder. Would you like to send in your troops classic-style, with the blonde flat-top hairdo? Or customize armor sets, possibly even issuing Reaper and Hyperion gear? It can be done, once the meter reaches the first tier. The next tier reward is a Team Fortress 2 mod, giving the Pyro a somewhat bug-faced new look, putting the iconic blonde flat-top on pretty much everyone else and issuing special badges to all. The final tier, should enough pre-orders flood in, entitles customers to a free copy of Civilization 5, which can be gifted to another player if you happen to already have a copy. 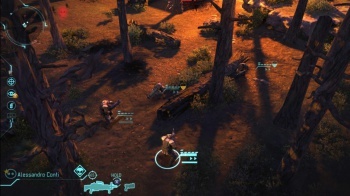 XCom: Enemy Unknown, the remake of the classic man-versus-aliens strategy game, promises complex tactical combat and base-building resource management in the spirit of its predecessors. You, as XCom commander, get to defend the planet against the alien threat by deploying troops in combat zones, capturing and reverse-engineering alien tech, and striking back against the enemy. If you want to know more, best head over here.